This is a guide to planting hibiscus seeds. The seeds you harvested and saved in a cigar box with mothballs are dying to get into the ground. In the Sun Belt, if you don't have a shade house or heated greenhouse, it is best to wait until after March 15th to start planting seeds. We would divide our crop into about four plantings, starting March 15th and on then on the 15th of each month thereafter or until our crop was depleted, we'd plant seeds. Roberta and I did this for 20 years. When planting hibiscus seeds, use the plastic trays that have about ten rows of little pots, two inches deep. Fill the cups with a fine potting mixture either Scott's or Sam Choice, and generously moisten the cubes before planting. With the point of an old ball point pen, place four holes in each cube. The holes should be twice the depth of your seed that you are planting. Author's note: If you have pods that are special or contain many seeds, do not plant them all at one time. This way you won't lose all of them if you experience a cold spell, a lot of rain, the birds discover them, etc. Before placing the seed into the hole, nick the bottom of the seed. I know they are small, but envision a coconut with the husk on, the flat bottom side is where you nick, You might ask youself "Do I have to nick the seed?" The answer is "Yes!" Why? When you nick the seeds, you will see that you expose a little piece of white seed meat. If no white seed meat is exposed, throw the seed away. You will find that in some varieties, more than half of the seeds will not be good and if you planted bad seeds, you will have used up a lot of valuable space in your seed tray. Author's note: We always made a diagram of what was planted in each tray and kept it in our studbook for our records. To nick the seeds, use a utility knife and change blades when it's necessary. Drop the seed into the planting hole using an eyebrow tweezer. Try to place the nicked part of the seed facing down. Although I don't know if this is necessary, I believe the important part of nicking is that it allows a little moisture into the seed's innards and promotes growth. Once your tray is planted, sift the potting soil that you are using and cover the seeds with this fine soil to the level of the dirt in the tray. I always dusted the trays with an application of SEVN, a fungicide made especially for preventing "damp off" of seedlings. Author's note: Damp off is too much watering or moisture. Put the trays into a mist bed if you have one, with a dozen 5 second mistings each day. If you don't have a mist bed, many of your local florist shops will let you use space in their hot house for the season. Or, if you live in the South Miami area, Carol and Luc will provide a spot for you. They have baby sat many a tray. If you don't have access to either a mistbed or greenhouse, place the seed trays in your yard where they will get filtered sunlight all day. Plant your seeds at a time when you know you are going to be home for three weeks because you might have to be ready to move the trays inside if a strong rain or a bad cold spell is predicted. Do not put any markers in your trays, the birds will find out what you are doing and your seeds will be their breakfast. Be sure to mist the tray three or four times a day- like their parents, those little babies do not do well in too much water. It doesn't hurt to add a little Peters fertilizer to your misting bottle after the seeds have broken through the dirt. Nicked seeds pop up from the trays at about the same time, 8-10 days after they're planted, and unnicked seeds take 3-4 weeks to come up and are very staggered. March plantings will take 14-20 days to germinate. As the days get longer and warmer, it will take 10-15 days. The seedlings' real battle begins as soon as the seedling emerges from the dirt. A hard rain will tilt the seeds over and they will die overnight. Damp off is the big enemy- too much watering will cause this and too little watering will allow the ground to get dry and your babies will burn to death. The first pair of leaves that appear on the seedling are called "seed leaves". They don't look like hibiscus leaves, but don't worry- a pair of adult leaves will appear in a day or two and this is to let you know that the seed is weaned and making it's own food. By now you are saying to yourself, "I didn't take hybridizing 101 and I only have 60 seeds, that's a lot of trouble for so few seeds". Try this method: prepare a quart pot the same way I have set forth in the previous paragraphs about trays. Use the same soil preparation, mark the side of the pot with the cross (the seeds' parents) and place the pot in filtered sunlight. Follow the same misting procedure and you will get a good number of seeds that take. When do you move up the seedlings that are growing? As a rule of thumb, I move seedlings either when they have at least five adult leaves or are about 3 inches high. Hibiscus seedlings are relatively easy to transplant. I suggest that you have a quantity of quart pots available. Smaller pots will also work. The potting soil should be a little heavier than the seedling soil. Author's note: Sam's Choice at Walmart is a good mixture and it has some granular fertilizer to promote growth. To get the seedling out of its little home in the tray, I use one of Roberta's long iced tea spoons. Fill the quart container and leave a hole in the center to deposit the seedling. Dig under the seedling with the spoon- dig deep as these seedlings grow a long taproot- and deposit the plant in the hole you have prepared for it. You may have to hold the plant erect- hold it by the foliage, not the stem- then tamp dirt around the seedling and be sure that it is no deeper than it was in the seedling tray. Place the pots in filtered sunlight and follow the same misting procedure. Be careful to monitor if any plants begin to wilt. For these, get them upright or within 24 hours it will damp off. Now that you have all of these seedlings growing, what are you going to do with them? Almost every hybridizer I visited had a different method. Harry Goulding had a series of beds created out of 4x8 sheets of plywood; small sided, somewhat waterproof. He would add Peters to the water to promote growth. Of course, I don't believe that Harry took off too often for extended fishing or golfing trips, so he was able to monitor the water so that it wasn't too wet for the plants. I tried this method, however, we traveled quite a bit and I lost too many plants to damp off. Carl Wilbanks had a large screened pool area where he grew his plants until the "Boss", changed that. Ted Bogart was one of the first to build a large shade house for his plants and kept his seedlings in there. Gordon Howard had his seedlings in 3 inch pots on a sheet of 4x8 plywood, elevated and stacked shoulder to shoulder. He watered by hand and had a mass of straight up and down plants striving to bloom. Once Roberta and I got into hybridizing, we were growing more than 1,000 seedlings a year and space became a problem on our city lot. We took a back corner of our lot and I constructed a 6x16 foot seedling bed. I put metal conduit pipe six inches apart, with a pipe every four feet. We then strung lightweight wire from one end to the other. When my seedlings were about 6 inches high in the pots, I would transfer them to the seedling rows. Every fourth row I would make wide enough to skinny through for weeding, new seedling planting, stringing the plants through the wire, and cutting off all lateral growth. One of the reasons we use staggered planting for our seeds was to have a replacement plant for either a throwaway seedling (one we didn't want to keep) or one that was special and we kept. With your throwaway seedlings, be sure that you make a note of the color, size, etc. on the back of the tag containing the seedling's cross. Author's note: Be sure you bury the tag when planting the seedling or the marking may be faded out by the sun by the time you get a bloom. You may have noted that all of my advice and comments were directed to those living in the sun belt. You mid-westerners and northeasterners should be able to follow the same procedure for hybridizng and planting your seeds. Plant your seeds on the same schedule you would plant fall plants. Those with green houses follow the same planting format that I have set forth for those living in the sunbelt. Author's note: I would appreciate it if some of you Northern Hybridizers and growers would add your knowledge and experience of hybridizing and planting seeds out of the sunbelt. Feel free to write to me and share your experiences. 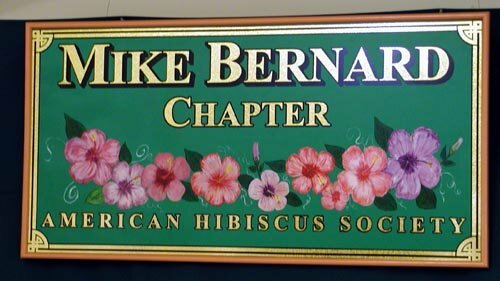 If you feel like you want to give hybridizing a go, check with the members of your local chapter and see what procedures they have found work for them. Follow their advice to at least get started. This will save you a lot of heartbreaks. Also, when you are ready to plant seeds, ask one of the veteran members to guide you along. It will help you and also make the "Old Salt" feel good. Remember that the seedling that you can't keep because it looks too much like Herm Geller can be potted up and given to a neighbor. To him, it will be a gold seal and he might join your chapter. Good luck and may all your seedlings be Gold Seals!